What the President didn’t know at the time he gave his message was that Minister Willis succeeded in securing an agreement with the Queen that committed the United States to restore her as the Executive Monarch, and, thereafter, the Queen committed to granting amnesty to the insurgents. International law recognizes this executive agreement as a treaty. The President, however, did not carry out his duty under the treaty to restore the Queen, and, consequently, the Queen did not grant amnesty to the insurgents. The state of war continued. President Cleveland acknowledged that those individuals who he sought the Queen’s consent to grant amnesty were not a government at all. In fact, he stated they were “neither a government de facto nor de jure (p. 453).” Instead, the President referred to these individuals as “insurgents (Id. ),” which by definition are rebels who revolt against an established government. Under Chapter VI of the Hawaiian Penal Code a revolt against the government is treason, which carries the punishment of death and property of the convicted is seized by the Hawaiian government. On July 3, 1894, the insurgents renamed themselves the Republic of Hawai‘i and continued to seek annexation with the United States. Article 32 of its so-called constitution states, “The President, with the approval of the Cabinet, is hereby expressly authorized and empowered to make a Treaty of Political or Commercial Union between the Republic of Hawaii and the United States of America, subject to the ratification of the Senate.” The insurgents always sought to be annexed by the United States. Additional protests were filed with the State Department by two Hawaiian political organizations—the Men and Women’s Hawaiian Patriotic League (Hui Aloha ‘Aina), and the Hawaiian Political Association (Hui Kalai‘aina). President McKinley ignored these protests and was preparing to submit the so-called treaty for ratification by the Senate when the Congress would reconvene in December of 1897. This prompted the Hawaiian Patriotic League to gather of 21,169 signatures from the Hawaiian citizenry and residents throughout the islands opposing annexation. On December 9, 1897, Senator George Hoar of Massachusetts entered the petition into the Senate record. Senators in support of annexation down to forty-six. Unable to garner the necessary sixty votes, the so-called treaty was dead by March, yet war with Spain was looming over the horizon, and Hawai‘i would have to face the belligerency of the United States once again. American military interest would be the driving forces to fortify the islands as an outpost to protect the United States from foreign invasion. On April 25, 1897, one month after the treaty was killed, Congress declared war on Spain. The Spanish-American War was not waged in Spain, but rather in the Spanish colonies of Puerto Rico and Cuba in the Caribbean, and in the colonies of the Philippines and Guam in the Pacific. On May 1, 1898, Commodore George Dewey defeated the Spanish fleet at Manila Bay in the Philippines. Three days later in Washington, D.C., Congressman Francis Newlands submitted a joint resolution for the annexation of the Hawaiian Islands to House Committee on Foreign Affairs on May 4. On May 17, the joint resolution was reported out of the committee and headed to the floor of the House of Representatives. Despite the objections from Senators and Representatives, it managed to get a majority vote and President McKinley signed the joint resolution into law on July 7, 1898. The military buildup began in August of 1898 with the first army base in Waikiki called Camp McKinley. Today there are 118 military sites throughout the Hawaiian Islands and it serves as the headquarters for the United States Indo-Pacific Command. In violation of international law and the treaties with the Hawaiian Kingdom, the United States maintained the insurgents’ control until the Congress could reorganize the insurgency so that it would look like a government. On April 30, 1900, the U.S. Congress changed the name of the Republic of Hawai‘i to the Territory of Hawai‘i. Later, on March 18, 1959, the U.S. Congress, again by statute, changed the name of the Territory of Hawai‘i to the State of Hawai‘i. 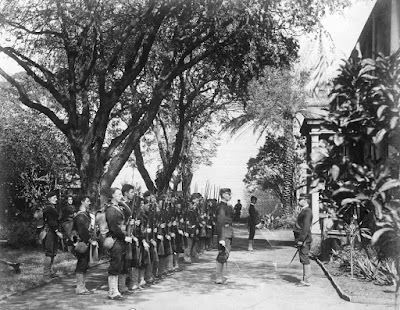 A state of peace between the Hawaiian Kingdom and the United States was transformed to a state of war when United States troops invaded the Hawaiian Kingdom on January 16, 1893, and illegally overthrew the Hawaiian government the following day. Only by way of a treaty of peace can the state of affairs be transformed back to a state of peace. The 1907 Hague Convention, IV, and the 1949 Geneva Convention, IV, mentioned by the UN official regulate the occupying State during a state of war.